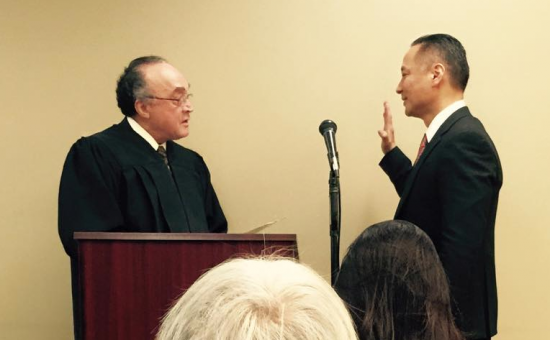 Public Defender Jeff Adachi is sworn in by Judge Donald Mitchell. SAN FRANCISCO — Pledging to battle racial bias in the criminal justice system, Jeff Adachi was sworn in for a fourth term as San Francisco Public Defender on Jan. 8. Superior Court Judge Don Mitchell administered the oath of office during the 8 a.m. inauguration ceremony. Adachi has served as public defender since 2003. Since then, he has reduced caseloads in order to improve representation; hired paralegals, investigators and social workers; and led the way with innovative programs in prisoner re-entry, criminal record clean-up and juvenile justice. As a result, the office has been recognized a national model in criminal and juvenile representation. Still, Adachi told assembled elected officials, supporters and staff that there is much work left to be done. Reducing racial disparities in the criminal justice system has become a top priority, he said. “Our system of justice is broken. We know this from what we see every day in the courts, jails and prisons,” he said. Adachi cited statistics showing that black motorists are four times more likely than white motorists to be pulled over in San Francisco and seven times more likely to be arrested. Black men are routinely subject to higher bails and harsher sentences and African Americans are four times more likely to be arrested for drugs than whites, even though both groups use drugs at similar rates. Much of the disparities are the result of implicit bias — unconscious prejudices carried by all human beings that affect their decision-making, according to Adachi. The Public Defender’s Racial Justice Committee, formed in 2013, will spend much of the next year assisting scientists and economists from the University of Pennsylvania’s Quattrone Center in a study to identify the root of bias in decision-making. Researchers will analyze local data related to race and traffic stops, bail, plea bargains and sentencing. San Francisco Supervisor London Breed, who spoke at the inauguration, recalled meeting Adachi when she was growing up in public housing. Adachi represented her friend who was wrongfully accused of a crime and ensured that the innocent girl did not go to jail. “If you don’t have a dime in your pocket, public defenders from this office will work so hard to make sure you have a fair trial,” Breed said.